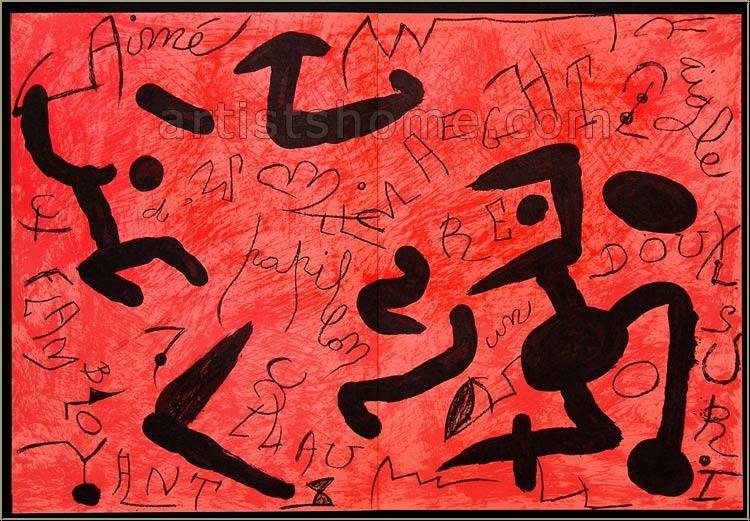 "Homage to Aimé and Marguerite Maeght"
Large original lithograph in colours by Spanish artist Joan Miro for the portfolio "Hommage à Aimé et Marguerite Maeght", published in 1982 as a retrospect on the occasion of Aimé Maeghts death. 24 of "their" artists contributed with original graphic works. Text on the reverse (int.al. 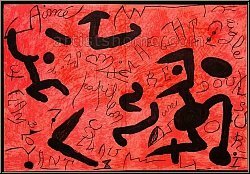 : "Miró, lithographie originale"), with the typical central fold and a few tiny holes from thread binding, as published. A well-preserved impression. Comes unframed. Fantastic service and delivery, however I was slightly disappointed with the size of the holes in the lithograph, which stand out significantly as they are devoid of all ink colour and are slightly 'fuzzy' from wear. The work was clearly advertised as having ' a few tiny holes from thread binding', but if I had known they we're so prominent I would not have purchased the work. ***Reply: We are sorry that you are not completely satisfied with your purchase. Thank you for your comments on the holes that come from former thread stitching. These little holes can be larger or smaller which differs from sheet to sheet. That's why we have added a few photos to our item description, as an example. We thank you very much for your input.